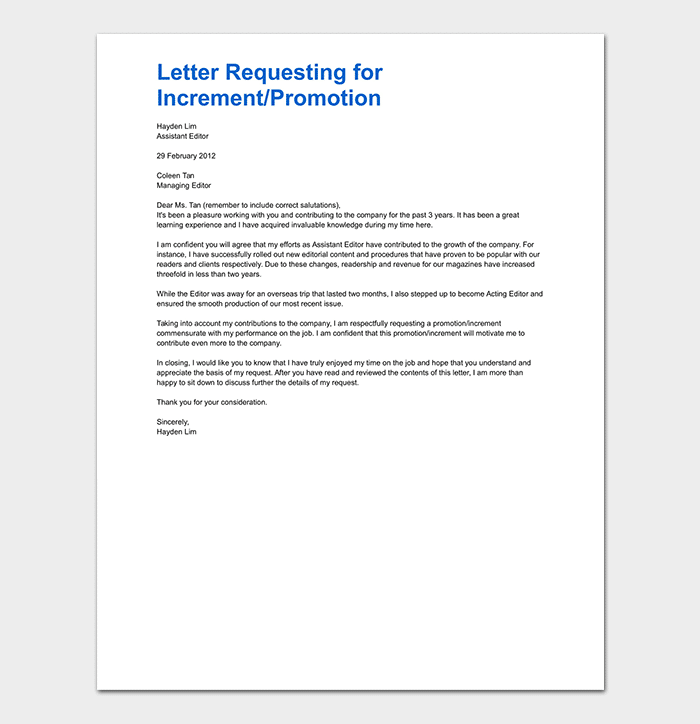 A promotion request letter is a letter written by an employee to senior management informing them of employee’s interest in getting a promotion to a higher position within the organization. 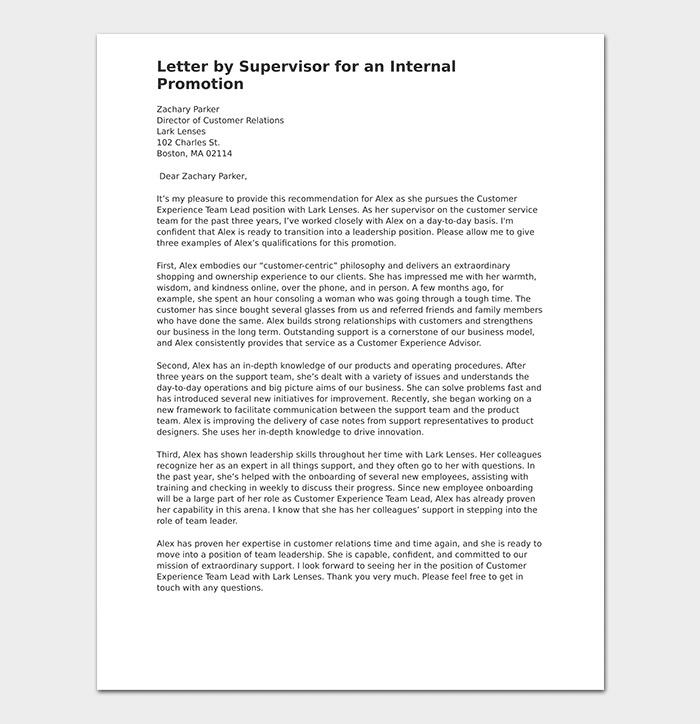 The letter should highlight employee’s suitability for promotion to the position in consideration. 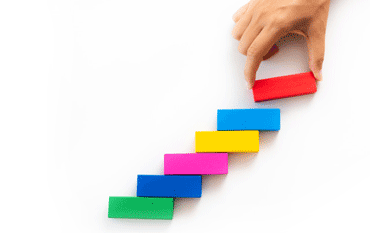 It is therefore important to outline performance record and skills. 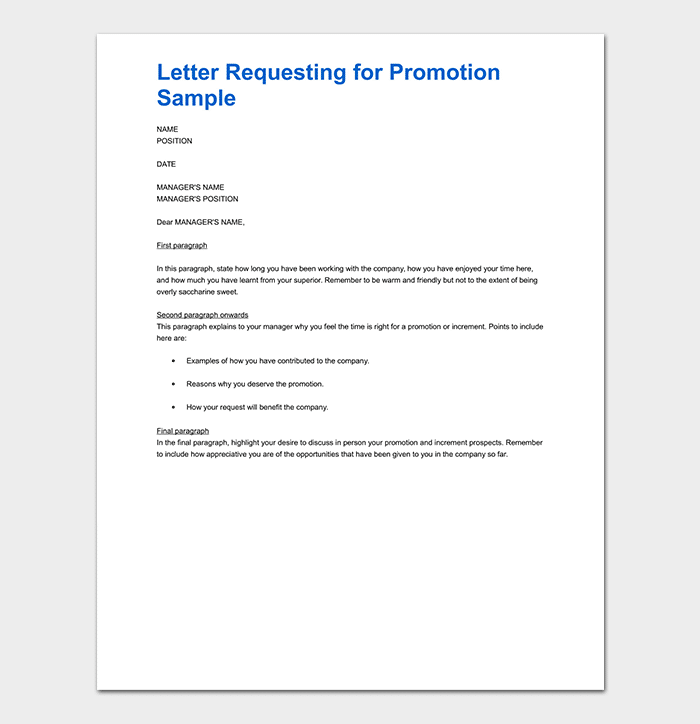 There are different problems that users may face when writing a promotion request letter. 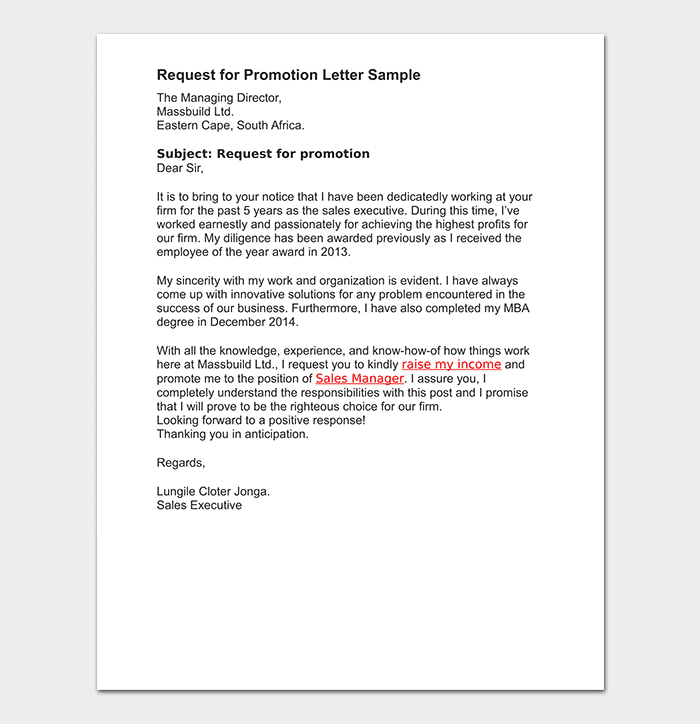 To start with, people tend to use the wrong template and format when writing a promotion request letter. 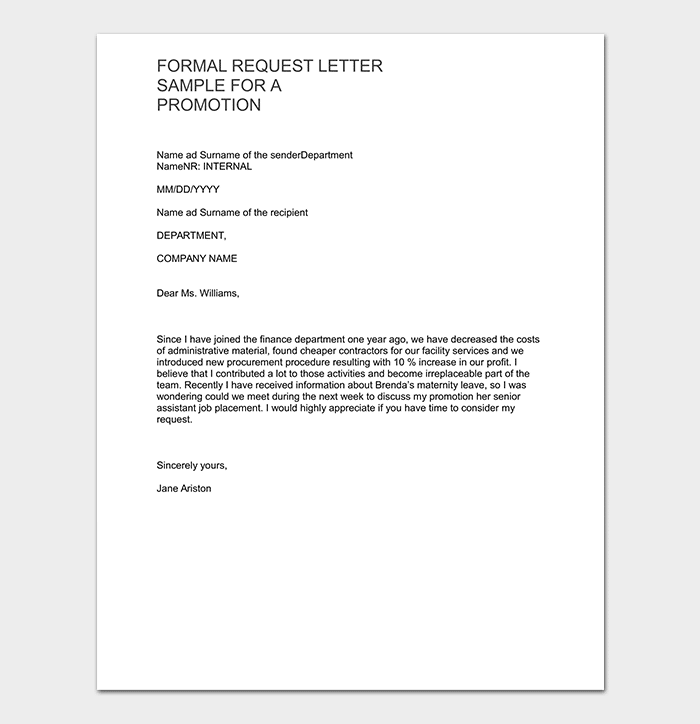 Using the right format and template demonstrate competence and seriousness of the employee requesting for promotion. Secondly, the tone of the letter should be formal. Remember, you are addressing higher authority in the organization. 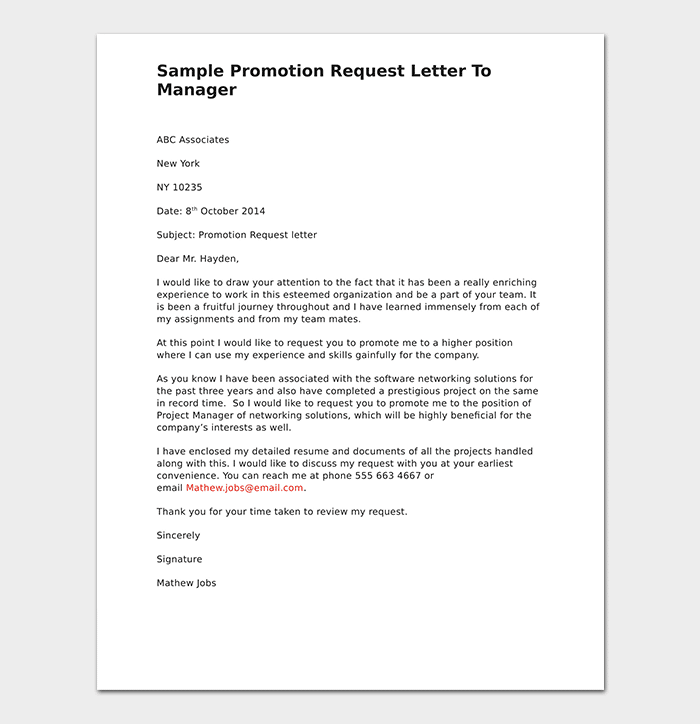 Using a sample promotion request letter as a guide can make things clearer and easier. 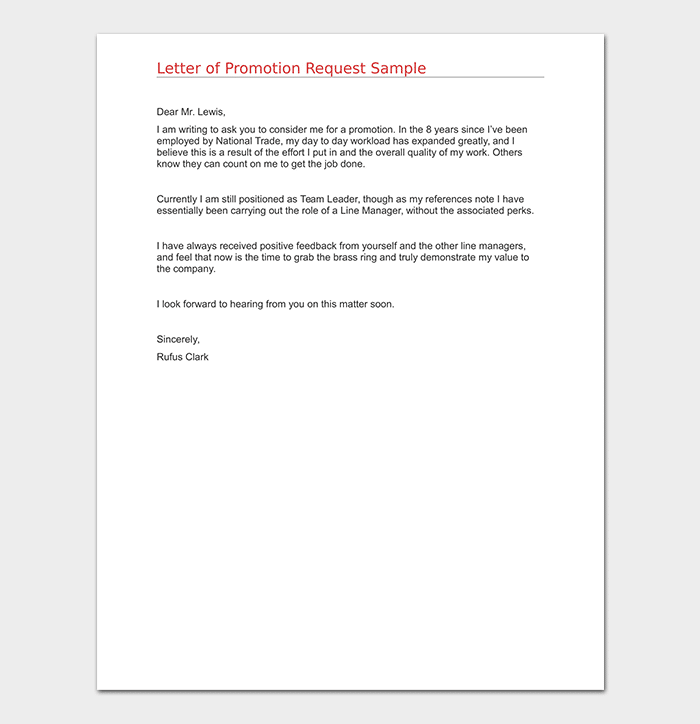 when writing a promotion request letter, there are several things you need to put in mind. 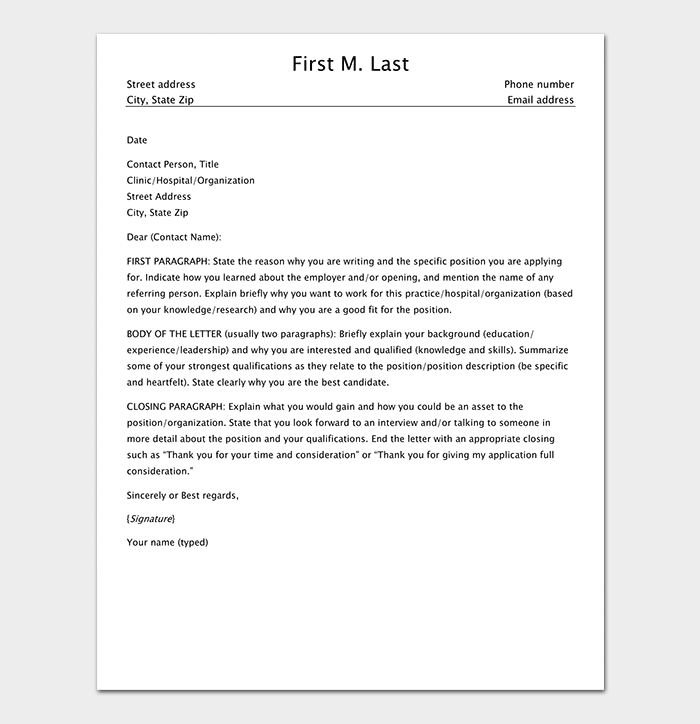 Considering the format, the letter should have the right address, date, and proper salutation. 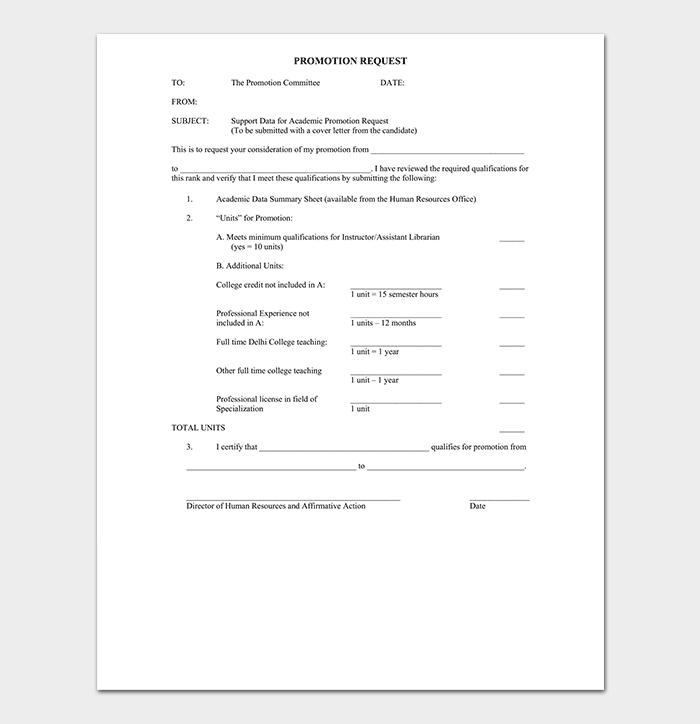 Start by outlining your position of interest. Explain your performance record, skills and experience. Highlight why you are best suited for promotion to the position thereby giving specific skills. You can close by requesting for a meeting with relevant management team. Be concise, formal and direct to the point. I would like to request for promotion to the position of (position in consideration). I have been in my current role for (number of years). I believe my experience, achievements and acquired skills make me the best person for promotion to (position). I joined the organization 7 years ago as a (position) then I got promotion after 3 years to my current position. I have always worked hard with a promotion to this position in mind. 2 years ago, I requested my head of department to be my mentor to prepare me for a promotion to (position). I feel I am now ready for the transition. I have successfully delivered in my current role. I was awarded the best employee in the team last year based on performance against peers. I have also acquired different skills in my current role that I believe have made me suitable for the position. These include (outline skills). I successfully undertook a project on (project) that greatly enhanced delivery of the department’s objectives last year. All these are some of the key skills needed to be (position). If I get this promotion, I believe the company will greatly benefit from my experience and skills. I would also like to request for a face to face discussion where I can highlight my strengths further. 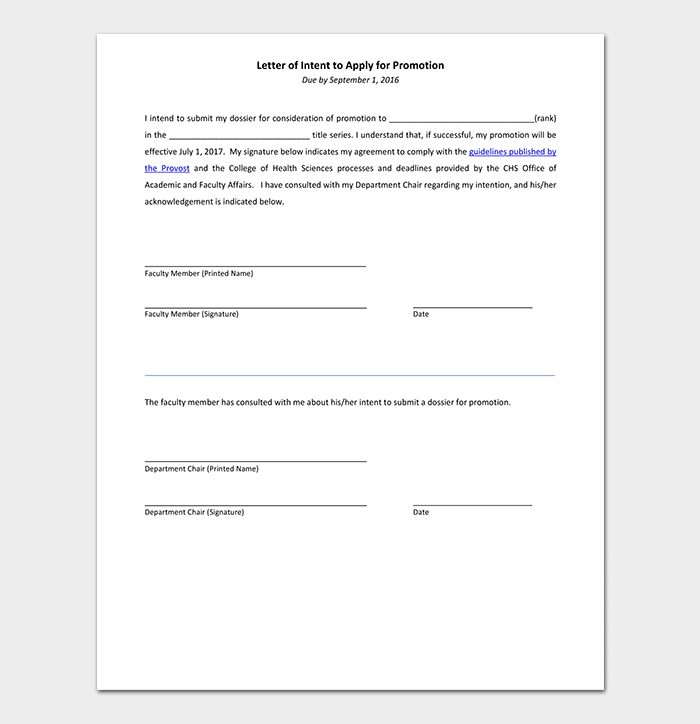 Academic promotion letter of recommendation is a letter mostly written by a university to an organization explaining recently acquired academic status of an employee. 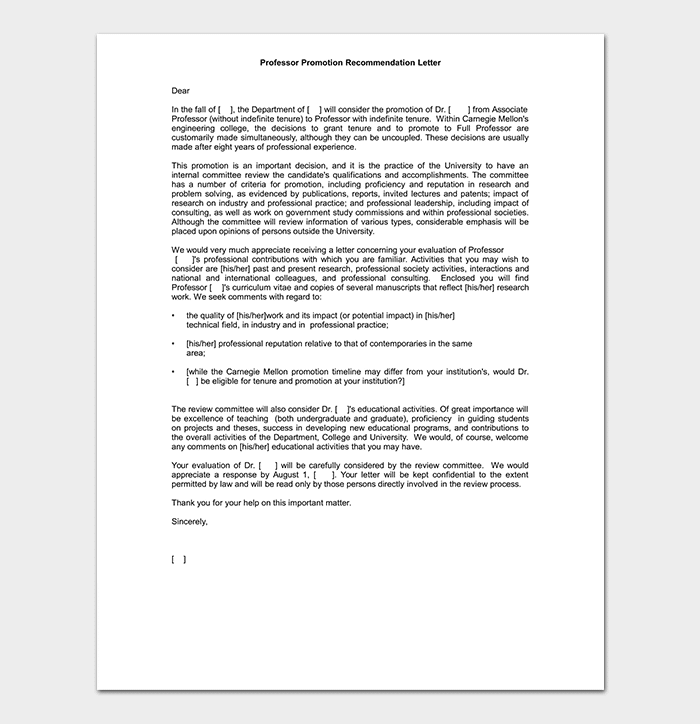 The employee can use this letter to request for promotion to higher position based on academic qualifications. 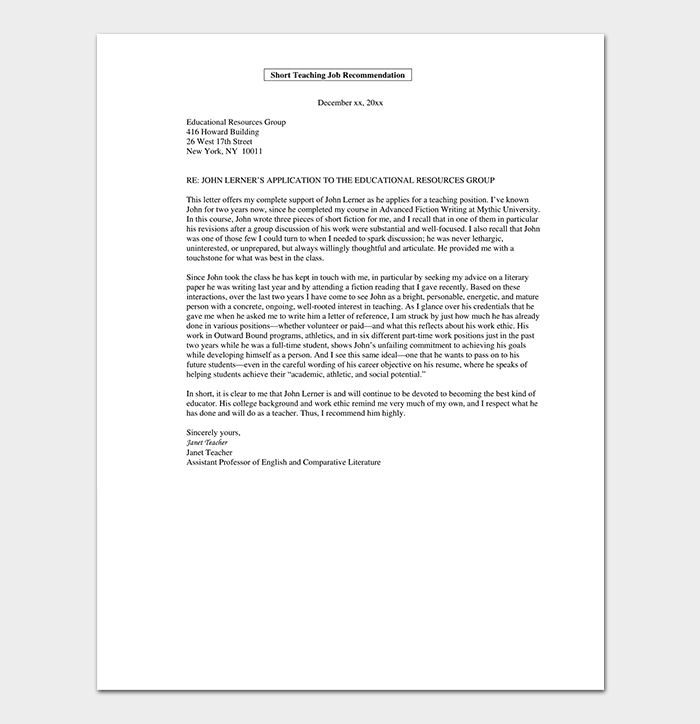 Professor promotion recommendation letter is written when a professor is seeking for promotion or requesting for grant for a study. It can also be written when a professor is moving to a different college where they will take up a higher role. 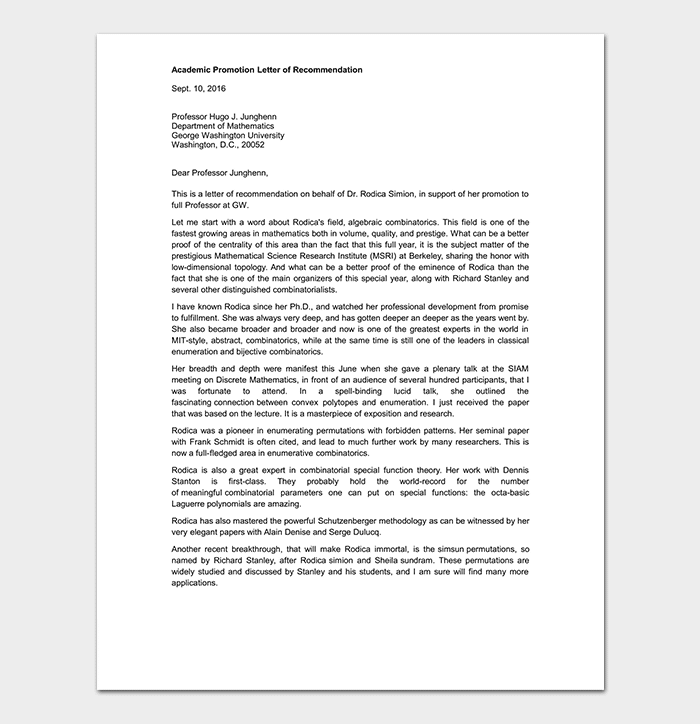 The letter is mostly addressed to the dean or board of directors of a university. 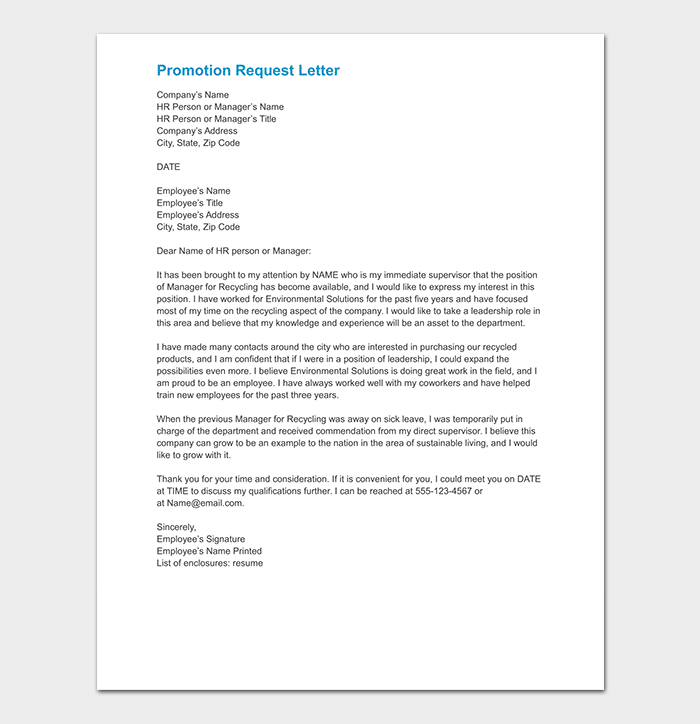 Promotion request letter to manager is a letter written by an employee to their direct manager requesting for promotion to higher position. The manager is very important because they understand the employee very well. 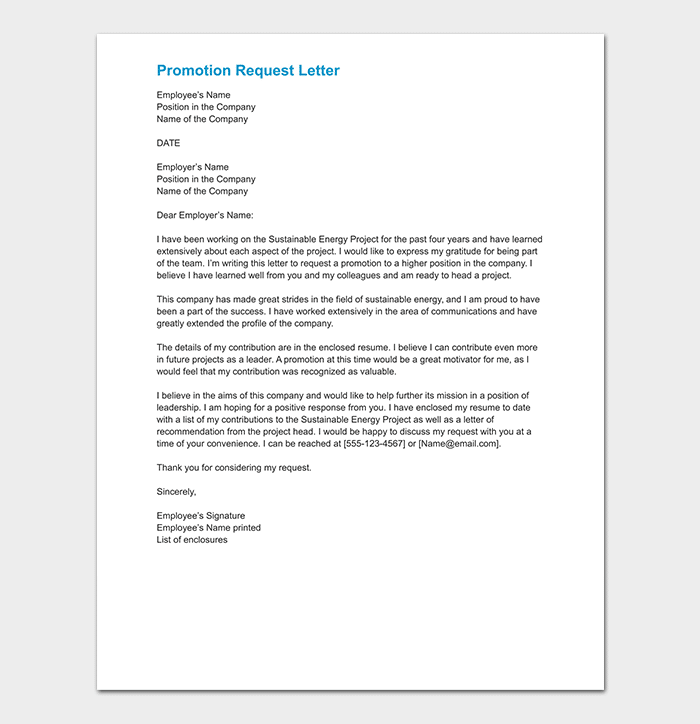 A promotion request letter should highlight all the skills, experience and qualifications that the employee. Also, the employee should outline why they are the most suitable for the promotion.